Sekeds and the Geometry of the Egyptian Pyramids. 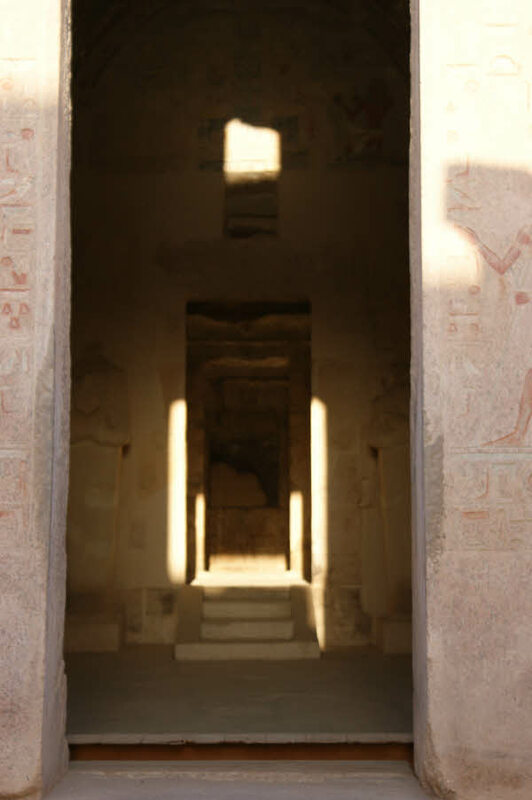 A fabulous week holiday in Luxor visiting many ancient sites culminating in celebrating the mid-winter solstice at the magnificent temple of Queen Hatshepsut. available through Amazon. Click books to follow the link. An excellent book by Richard Wilkinson describing the different temple sites of Ancient Egypt. A clear concise book on the history of Egypt. The definitive book on the pyramids. Information on all of the gods and goddesses of Ancient Egypt. An excellent guide to learning hieroglyphs. 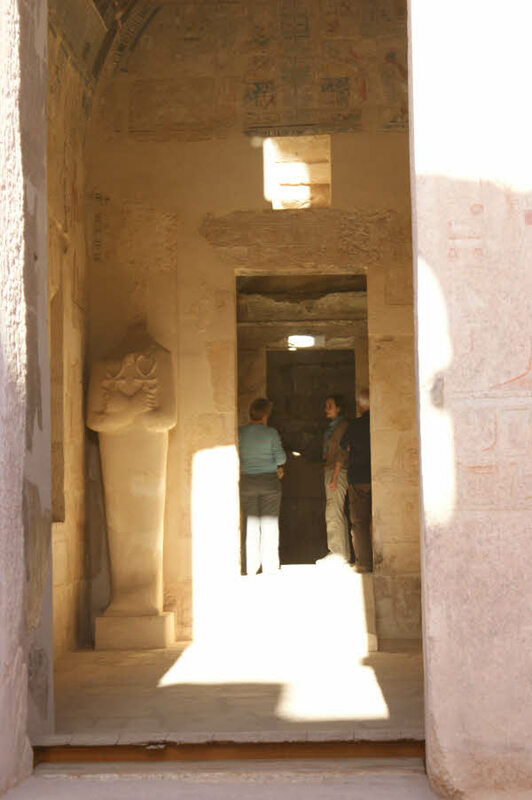 Detailed information on one of the most famous sites in Egypt. 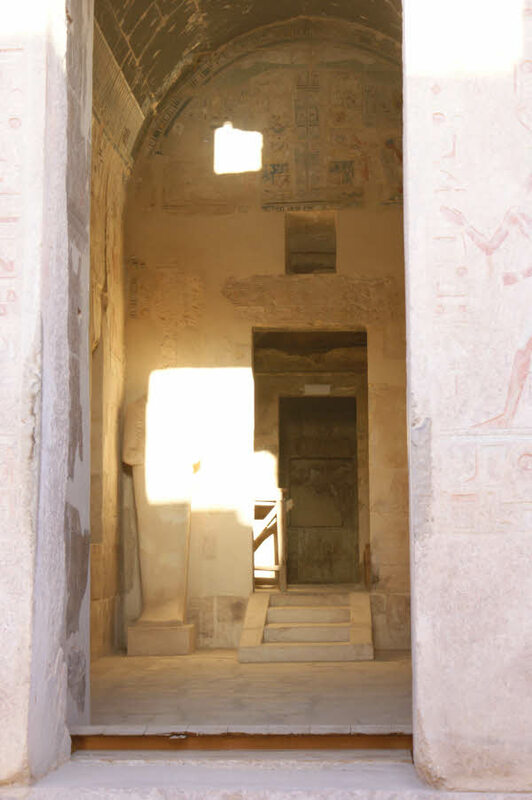 This paper examines the mid-winter solstice alignment within Hatshepsut's Mortuary Temple at Deir El Bahari. 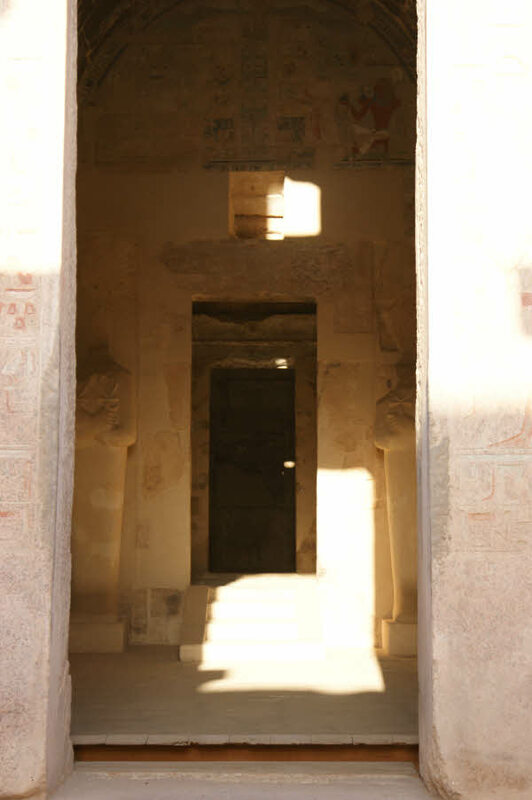 Hatshepsut’s mortuary temple at Deir El Bahari, called by the Ancient Egyptians Djeser-djeseru, ‘sacred of sacreds’, is recognised as one of the architectural wonders of the world. 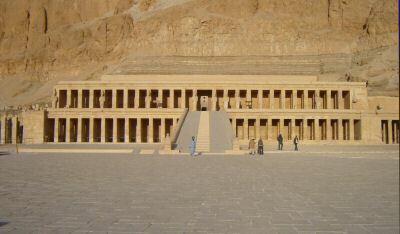 Designed by Senenmut for one of Egypt’s most illustrious queens the temple was constructed around 1450 BCE. It is set against the backdrop of the Theban cliffs and rises in a series of three tiers. 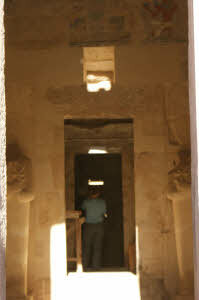 In the centre of the upper level is a doorway entrance that leads into an open court. Opposite the doorway and cut into the bedrock is a sanctuary chapel dedicated to the god Amun (Fig. 2). The width of the open court is just under 23½ metres with the chapel extending a further 19 metres into the rock. When stood at the rear of the innermost chapel facing the entrance there is a clear aperture lens view through to the horizon of 2° ±¼°. 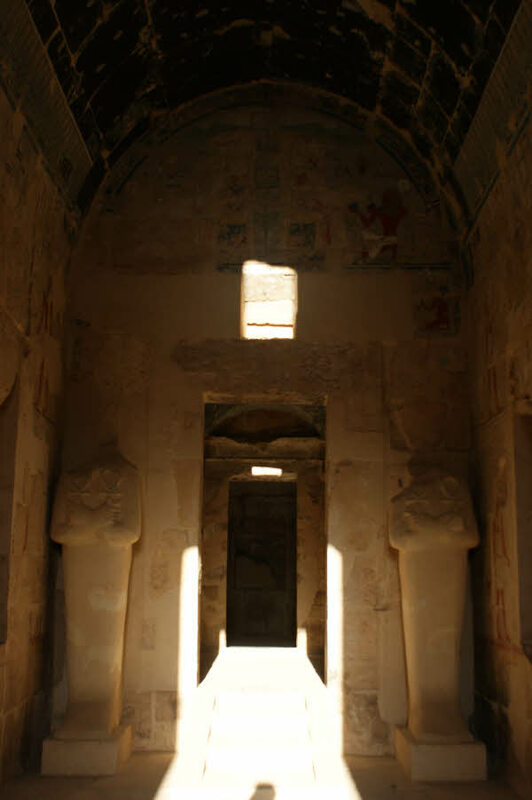 Hatshepsut’s temple is ideally placed to view astronomical events towards the eastern horizon, which includes Moon and Sun rise as well as the Orion constellation and the star Sirius. The alignment of the temple is set on an azimuth of 116½° ±½°, which when first discovered suggested a mid-winter sunrise alignment. Whilst such events can be postulated in theory they can only really be proved by being tested out on site at the relevant day of the year. The mid-winter solstice sunrise of 2007, set to 22nd December provided such an opportunity. On the day of the solstice a band of low cloud could be seen close to the horizon (see Fig. 3), which made it very difficult to make out the horizon even with binoculars. Calculations had suggested that the sunrise would occur at 06.32. 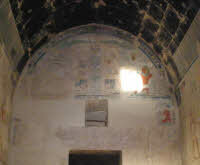 In fact the first rays of the morning Sun were not visible until 06.33 when the Sun was perceived very close (±¼°) to the meridian line of the chapel (Fig. 4). However it is still not possible to determine whether this view showed the Sun breaking the horizon or cloud line. The orb of the Sun occupies about ½° of the ecliptic at the horizon, its light, in effect, occupying a quarter of the visible doorway entrance. 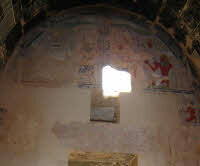 The first rays of light from the Sun dramatically projected a reddish pink rectangle onto the rear wall of the chapel that very neatly fitted the width of a niche to be found there (Fig. 5). 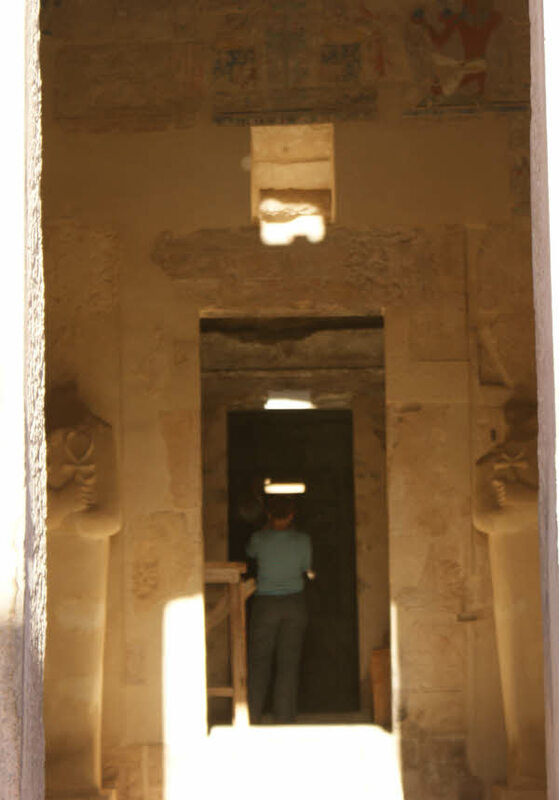 As the sun rose the projected rectangular light image, from the entrance doorway, slowly moved to the right before finally moving off the rear wall about 11 minutes after its first appearance. We can now be sure that this same event has occurred annually for the past three and half thousand years and will continue to do so in the future. In addition to the primary sanctuary of Amun at Hatshepsut’s temple, two other chapels, those of Hathor and Anubis, are on the same solstitial alignment reinforcing the significance of the midwinter sunrise at this temple. Whilst the sunrise experience provided the main focus of the visit on the 22nd December one other significant feature within the temple design was observed. Set above the entrance doorway to the inner sanctuary is a rectangular aperture measuring approximately 44 x 44 cm set some 5.57 metres above the floor level. 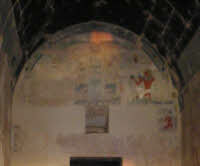 The light from the rising sun penetrated through this box onto the upper part of the east wall of the first of the inner chapels. 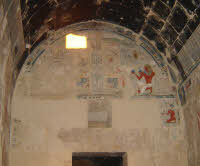 The scene shows Tuthmosis III kneeling in supplication before the god Amun. 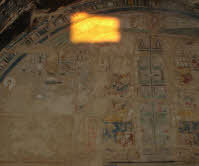 From the photographic evidence the first rays of the Sun projected a bright light onto the meridian line of this scene before moving downwards and to the right to illuminate first the god Amun and then moving on to shine on Tuthmosis himself, before finally illuminating the god Hapy (Fig. 7). This phenomenon would be repeated each day, saving that the start position of the projected light would be a little lower on the wall as the altitude of the Sun changed. 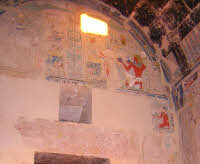 A closer examination of this first wall showed another light box aperture had been created that would allow sunlight to penetrate through to the rear wall of the innermost sanctuary (See Fig 6.). Clearly this was not set to work at the mid-winter solstice but to some period before and after the 21/22 December date, when the "holy of holies"would again be illuminated albeit in a slightly different way from the solstice. The inner light box funnels to a slit aperture measuring 25 x 10 cm. This would appear to be suitable for illuminating the eyes of a statue placed at the correct height, although no such statue has been found in the chapel. Calculations from onsite measurements show that the light box determines an altitude angle of eleven degrees thirty-seven and a half minutes (11º-37.5'). This being so then the morning light of the Sun should next penetrate through to the inner chamber, via the light-box around 10/11 November and again on 31 January and 1 February, about forty-one days before and after the solstice. The reason for these dates in not clear and possibly relates to some cultic practice or festival. It is just possible that it represents the division of the solar year into eight segments of forty-five days (360/8). The first showing would certainly give a day count towards the culmination of the sunrise at midwinter. 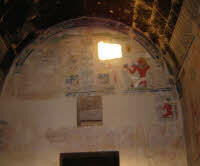 On 23rd January 2008 I had an opportunity to revisit the temple and record the effect of the light box on the upper chapel wall. 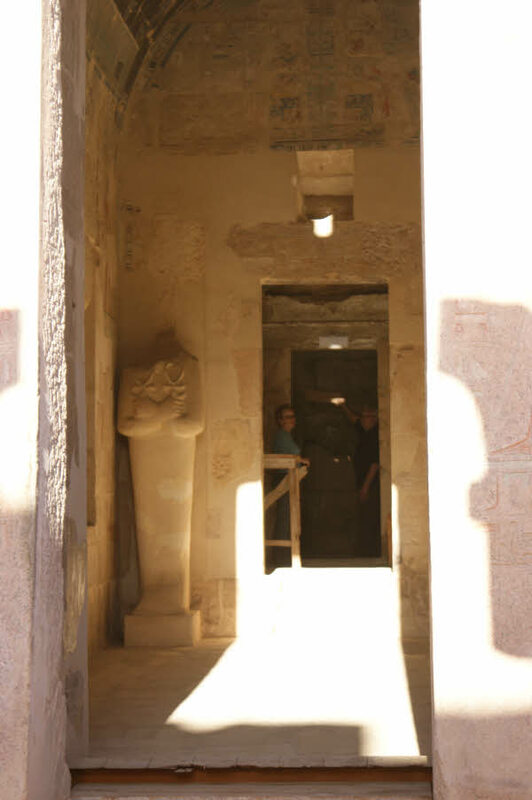 As can be seen from the photographic evidence movement of light starts to the left of the median line and first illuminates the god Amun that faces Queen Hatshepsut before moving down and just missing the light box. Figs 8 and 9 compare these differences. 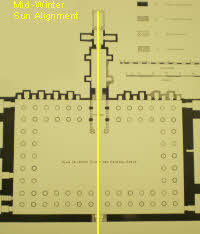 The altitude angle of the "light box" offers another possible explanation, apart from a solar alignment, which would have been visible at the time of the temple's construction; namely an alignment to the star Sepdet (Sirius). For a few minutes each night when Sepdet was visible the star would transit across the aperture. This phenomena would have worked for about three hundred years after the temple's construction after which time the effects of precession would shift the placement. In January 2011 and February 2013 I had an opportunity to visit the temple again and obtain further photographic evidence of the solar alignment.The visits relate to the period between January 27th and February 4th. The photos show the progression of the alignment as the sun climbs higher in the sky through this period. 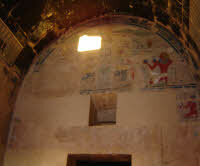 The first three pictures are taken on 27 January 2011 and the next three on 31 January 2011, where I had permission from Dr Zahi Hawass to take photos from within the inner chapel. The last set of three photos were taken on 4th February 2013, when the Polish team were also exmaining this phenomenon. Photo taken at 7.06. The sun square can be seen moving towards the 'light-box'. Photo taken at 7.23. There is now an alignment between the light coming through the outer doors and the sun square, which is aligned with the 'light-box'. Photo taken at 7.38. 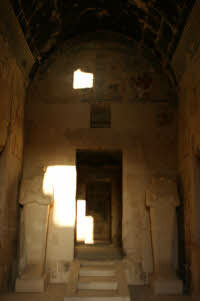 The sunlight can now be seen to penetrate through to the rear wall of the innermost chapel. Photo taken at 7.09. The sun box has dropped a little further and is closer to the left hand wall from the picture above. Photo taken at 7.31 the sunlight from the doorway and the 'light-box' are now aligned and the sunlight has pentrated through to the lintel of the door of the innermost inner chapel. Photo taken at 7.38. 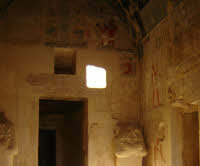 The light from the sun can now been seen to create an illuminated rectangular box of light on the rear wall of the innermost chamber. Photo taken at 7.12. 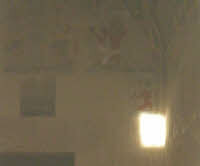 The light square and the door light pattern are closer to the left wall from the above photo. Photo taken at 7.45. 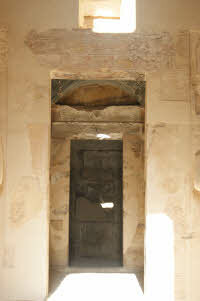 The sunlight outer door image now aligns to the doors of the inner chambers but the 'light-box' penetration has now passed. This photo needs to be compared with the others above. 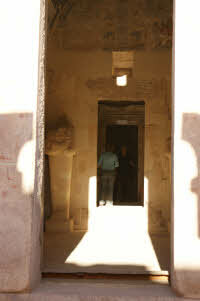 Photo taken at 7.37 where the square from the sunlight is just starting to penetrate through to the innermost wall. Photo taken at 7.42. There is now a split in the light penetration with two clearly discernable strips. One which can be seen at head level and the other at waist level of the standing individual. Photo taken at 7.43. At this point the Polish team are carrying out some experiment. Photo taken at 7.42. There is now both an upper and lower light band. However I was unable to determine whether this was caused by some experiment being carried out by the Polish team. The photographic evidence obtained from the visit to the Hatshepsut’s temple on the 22nd December 2007 and again on the 21st December 2008 affirms this midwinter solstitial alignment of this temple. It adds considerable weight to the view that celestial phenomena played a significant part in determining the alignment of some of the temples of Egypt. The excellent view through to the eastern horizon would most probably have been used to determine other celestial events such as the heliacal rising of Sirius. 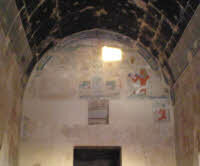 The evidence from the visits in 2011 and 2013 confirms the light penetration onto the rear wall of the the innermost chapel. From the evidence of these photos it would seem that the truly aligned penetration occured at some date between the 31st January and the 4th February, with the most likely dtaes being around the 2nd or 3rd of February. However in 2011 the solstice was on 22nd December and in 2013 on 21st December. 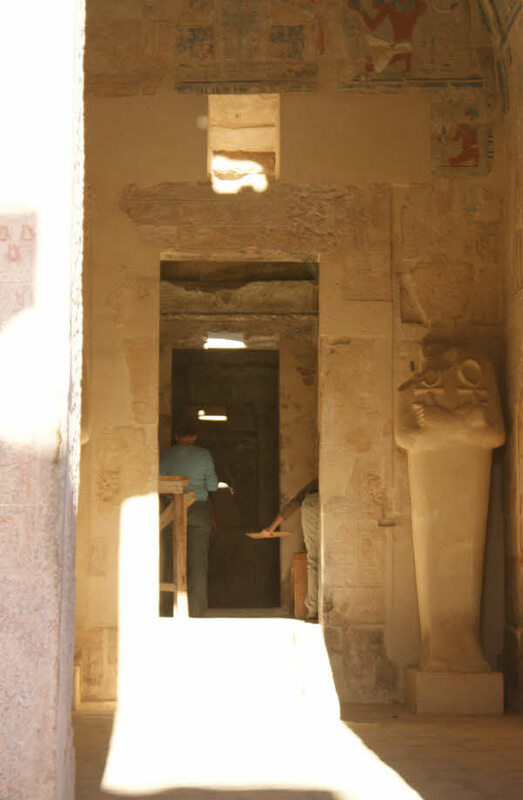 We are therefore looking at two dates between 40 to 45 days before and after the solstice for the light penetration to occur in way where the light is aligned with the outer doorways of the temple. Assuming the latter day count is correct then this is an approximate quarter division of the 360 day Egyptian year and equates with Samhain and Imbolc of the Celtic calendar. 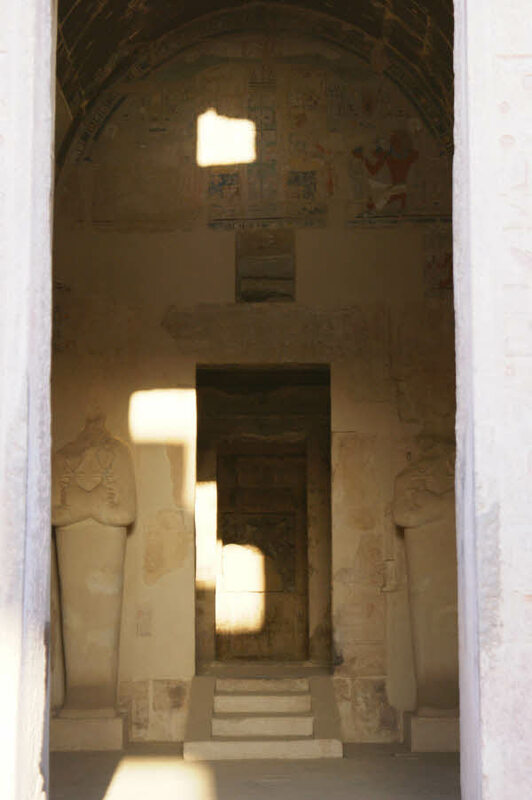 Further research is clearly needed to uncover the significance of the 'light box' and the way that it was used to illuminate the innermost chapel of the Amun sanctuary. Orientation of Ancient Egyptian Temples 1: Upper Egypt and Lower Nubia (2005) by M Shaltout and J Belmonte. Plans of the different Temple sites taken from Google Earth mapping Programme. The first rays of the morning Sun. 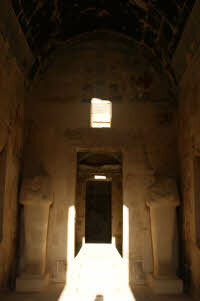 View from within the inner sanctuary. View from within the inner chapel. The inner slit "light box" aperture can just be made out above the 2nd doorway. The doorway entrance to the inner chapel about an hour after dawn. The light box image just be made out. 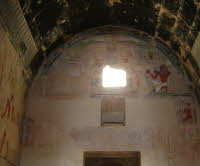 In 1450bc the star Sirius would have passed acoss the "inner light" box aperture every night when visible in the sky. The duration of this transit would have been about five minutes and may have been intended to link the cult statue of the god with the star.